Pen-and-ink drawing of sculptures of Shiva, Harihara and Varaha from the Ravula Phadi Cave at Aihole, by an Indian draftsman, dated 1853. 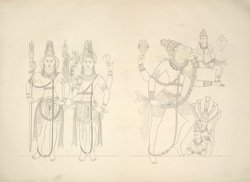 The two figures to the left in this drawing represent Shiva and Harihara, the combined form of Shiva and Vishnu. These large sculpture panels are carved on the facade of the Ravana Phadi cave at Aihole, excavated in the late sixth century, in the Chalukya period. The standing figure of Shiva rests on the right foot and holds a long trisula (trident) in the right hand while the left hand rests below the waist. Next to him is Harihara. The right half of him is Hara or Shiva and the left is Hari or Vishnu. In the upper right hand he holds a cobra, while in the lower right hand he holds the akshamala (rosary of beads). In the upper hand he carries a conch, while the lower left rests on the waist. The figure to the right in the drawing is Varaha, the Boar incarnation of Visnhu who assumed this shape when the demon Hiranyaksha pushed the earth into the cosmic ocean. He killed the demon, plunged into the ocean and brought the earth up on his tusks. Near the feet of Varaha there is a five-hooded Naga with his consort in attitude of adoration. This sculpture panel is carved on the left wall of the sanctuary antechamber.